Pocket CFO – Profiting from Financial Statements course is a mobile learning application from Intersog, which is being designed to give individual investors the insight and information they need to utilize corporate financial statements. The application has been featured with a full-text course book, helpful review flashcards, comprehensive topical tests and realistic examples. The contents of the Profiting from Financial Statements course is based the work of Professor and best-selling author Dr. Jae K. Shim. Objectives of financial statement analysis. Overview of financial statement analysis. Interim statements and segment Analysis. Full course text divided by chapter. Interactive flashcards for subject review. Explanations of right and wrong answers. The Pocket CFO – Profiting from Financial Statements course (version 1.0) is now available for free download from App Store. 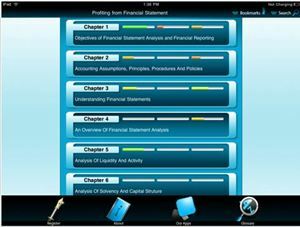 The Financial Statements course is compatible with iPad and running on or later.